It wouldn’t be a proper day at the beach without bar-hopping at resort hotels. For both locals and tourists, sipping a pina colada or salty margarita while watching the sunset in the sand is the perfect end to any day of the year. In 2016, Clearwater Beach and St. Pete Beach were ranked No. 1 and No. 4, respectively — and they're still in the rankings this year — on TripAdvisor’s list of the country’s best beaches. So, not surprisingly, those two have some of the most popular beach hotel bars around. Some are rooftop hangs, others are places to drink with your toes in the sand. And one has become a must-see destination thanks to a certain famous marine artist and conservationist. Whatever your vibe, you’re sure to find a sunny or shady spot to imbibe at one of these waterfront bars. 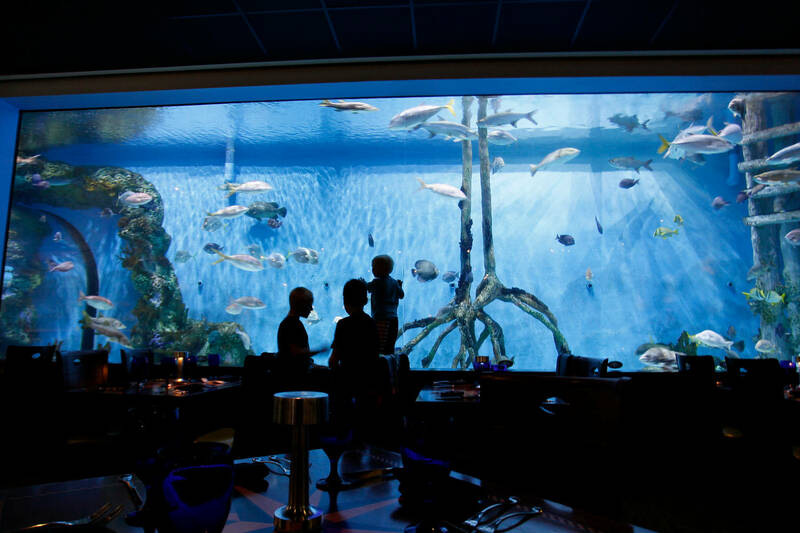 The dining area at Rumfish Grill is known for this massive fish tank. The fish know what you’ve been drinking. The full bar has its own fish tank. And screens to please the sports-loving drinker. 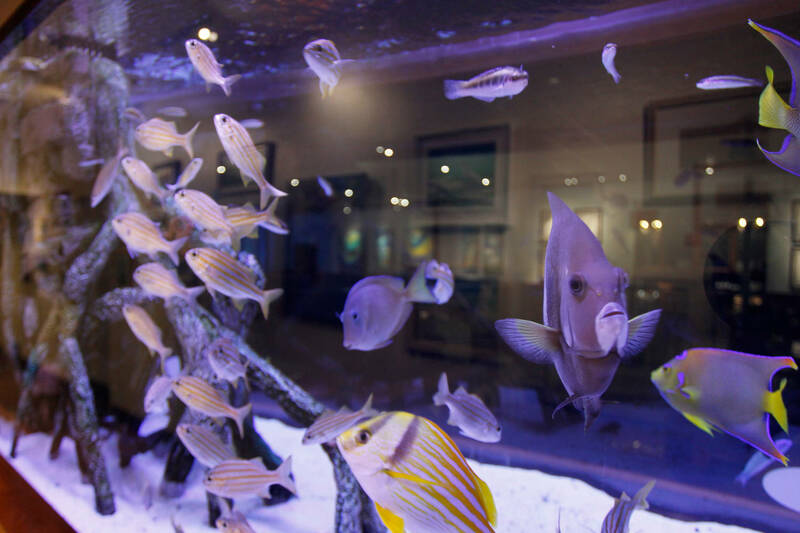 The world-renowned marine wildlife artist and conservationist Guy Harvey lends his name and colorful style to this outpost. Both the inside and outside bar areas are traditionally beachy while still feeling luxurious. 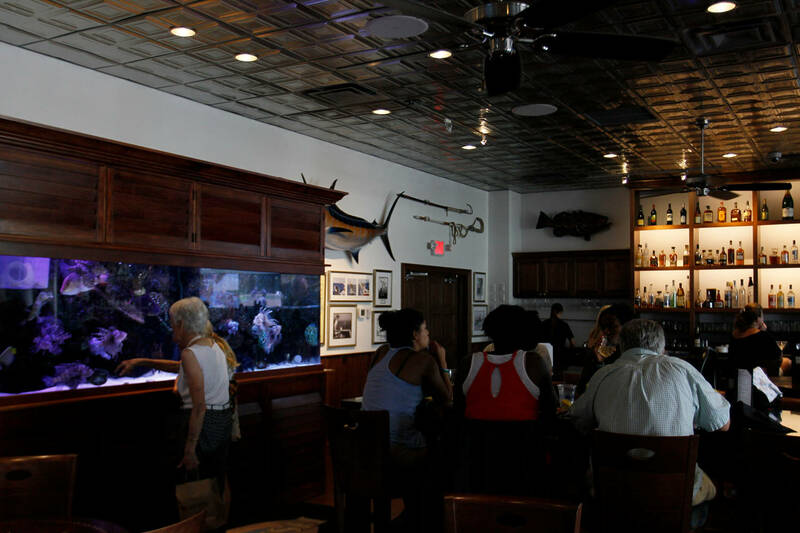 While the dining area is known for its massive custom-made fish tank, those looking for just drinks can get the same menu and level of service at the bar. And you’ll still get to drink a 3 Daughters Key Lime Cider next to a tank of lionfish. Drink this: Rumfish boasts a trio of decadent liquid desserts. Good luck choosing between the Snickers martini, bananas foster martini and the chocolate cream pie martini. 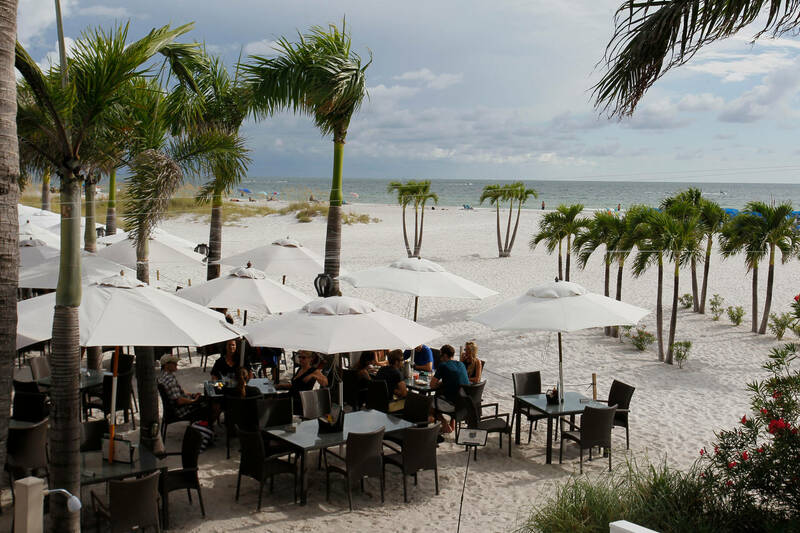 Insider’s tip: Rumfish is one of the few beach spots that has free parking available for those just coming to the bar and restaurant. Open: 11:30 a.m. to 2 p.m. and 5-10 p.m. daily. Bar hours 11 a.m. to midnight daily. Info: 6000 Gulf Blvd., St. Pete Beach. rumfishgrill.com. Daytime is partytime, too, at PCI Beach Bar at the Postcard Inn. Giant chairs and plenty of stares at PCI Beach Bar. At Postcard Inn in St. Pete Beach, try the the PCI Punch and soak up the party vibe. For those who remember the old Swigwam in this location, the structure hasn’t changed much. 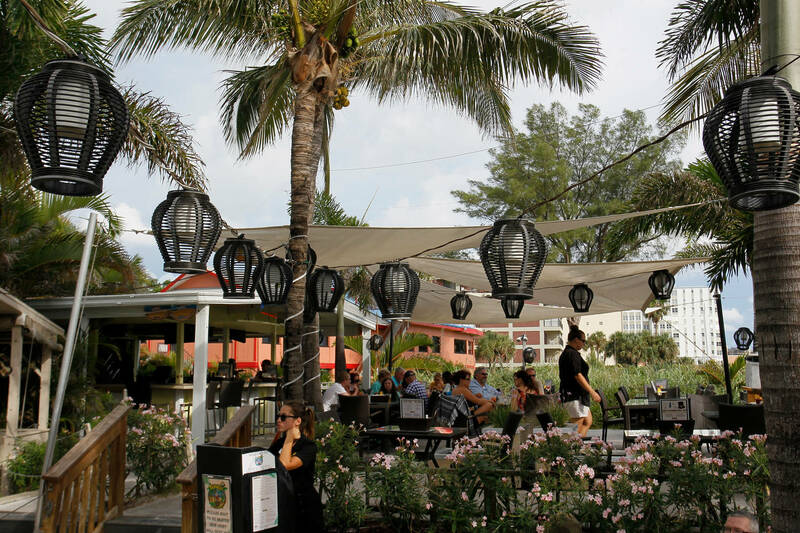 Whether you’re strolling up to the PCI beach bar or relaxing at the Boathouse Kitchen & Bar, Postcard Inn is an essential stop on any St. Pete Beach bar hop. Catching on to the craft beer craze, the hotel bar has a solid lineup of local brews, including staples from 3 Daughters and Cigar City. There are even a few refreshing picks from Orange Blossom Brewing, like the honey pilsner. Drink this: When at PCI, get the PCI Punch: Bacardi Oakheart spiced rum, coconut rum, housemade punch, pina colada mix and cherry liqueur with an orange peel and filthy black cherry. Insider’s tip: Check out Postcard Inn during the week for a three-hour happy hour from 4-7 p.m.
Open: 11 a.m. to midnight Sunday through Thursday, 11 a.m. to 1 a.m. Friday and Saturday. Info: 6300 Gulf Blvd., St. Pete Beach. 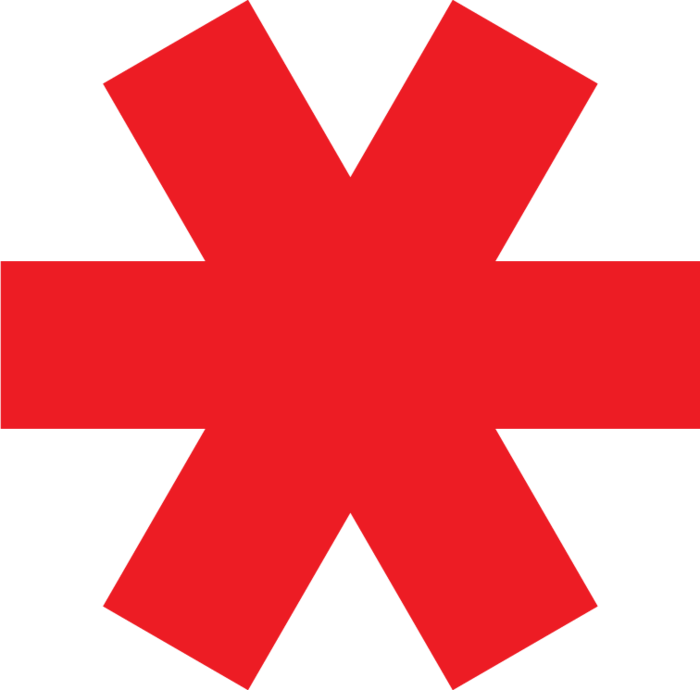 postcardinn.com. 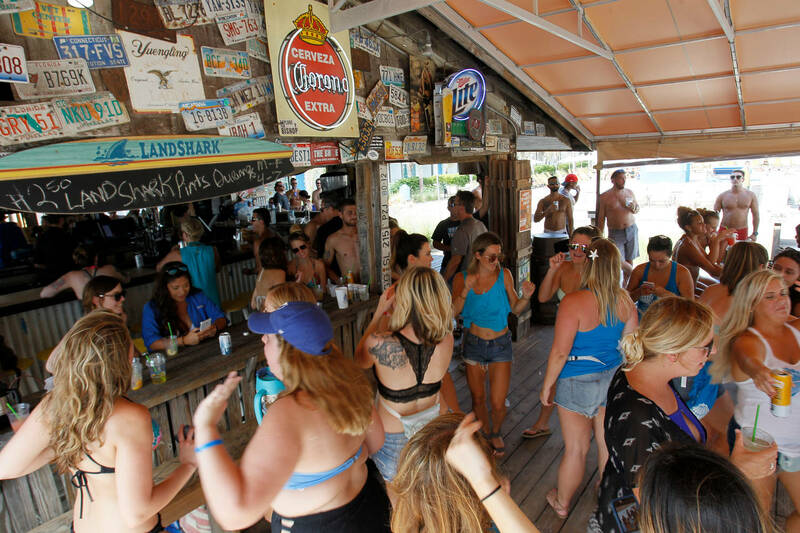 Jimmy B’s has the simple, yet essential elements of a great beach bar — inexpensive drinks, delicious food, great views and friendly bartenders. There’s live music daily and every night the bar toasts to another sunset in paradise with all guests getting a free sunset shooter. Now, about those cheap drinks. While many beach hangs sport $11 and up cocktails and even beer, Jimmy B’s has a whole page of tropical drinks, frozen concoctions and specialty cocktails under $10. A 120-lb woman needs only 2 drinks, on average, to reach .08 BAC. A 200-lb man needs 4 drinks, on average. Drink this: Get the full Jimmy B’s experience with The Wet Spot — a pina colada with a blueberry twist. Insider’s tip: Contact The Beachcomber to find out how you can apply for the Platinum Club at Jimmy B’s. The membership gets you discounts on food and drinks at Jimmy B’s and Bongos Beach Bar at the Grand Plaza Hotel down the street. Open: 11 a.m. to 3 a.m. daily. Info: 6200 Gulf Blvd., St. Pete Beach. beachcomberflorida.com. 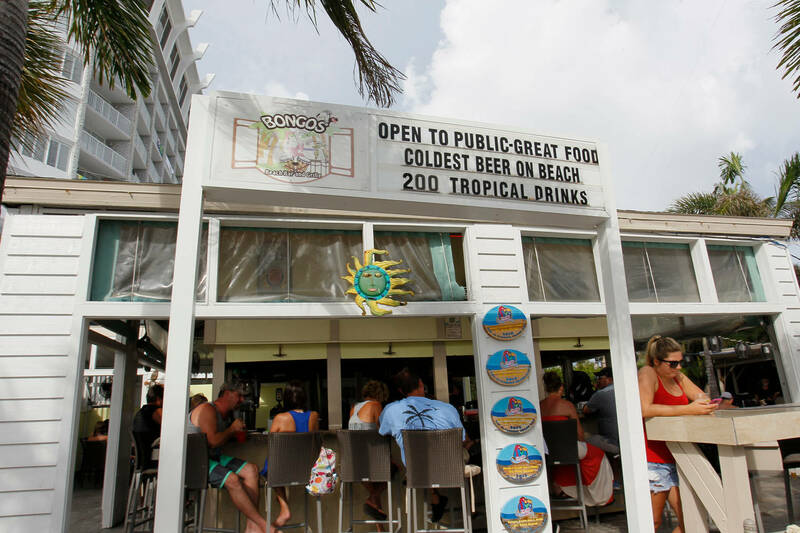 At Bongos Beach Bar & Grille in St. Pete Beach, there's live music daily and reasonable drink prices. Coldest beer on the beach? Always good to know. Dine right beside the sand. Take a scenic elevator up to Level 11, the 360-view rooftop bar at the Grand Plaza Hotel with the best seats for a St. Pete Beach sunset. The view from Level 11 is hard to beat. Oh, Level 11. We’ll have one of those, please. Just take a moment to appreciate that we live here and can visit all the time. At the Grand Plaza Hotel, you’ve got bar hopping options for both day and night. During the day, soak up the sun at Bongos Beach Bar & Grille. Bongos also boasts daily live music and a whole page of specialty cocktails under $10. At night, take the scenic elevator up to Level 11, the 360-view rooftop bar with the best seats for a St. Pete Beach sunset. The scenic lounge offers an impressive list of craft cocktails like the raspberry lavender lemonade, a blood orange margarita and the cool cucumber - a frozen drink featuring ice cream. Drink this: The Eleven Martini — Hendrick’s gin, agave nectar, mango syrup, muddled strawberries and mint. Both Level 11 and Bongos offer the chocolate monkey frozen drink, which is basically an alcoholic milkshake. You won’t regret that one. Insider’s tip: If you’re not staying at the hotel, ask the parking attendant about parking for Bongos and Level 11. The lots fill up during the summer vacation season, but now that summer is ending you’re more likely able to find a prime spot. If not, the beach access parking lot isn’t too far of a hike from the Grand Plaza Hotel. Open: Bongos from 11 a.m. to 3 a.m. daily. Level 11 open 3 p.m. to 1 a.m. daily. Info: 5250 Gulf Blvd., St. Pete Beach. grandplazaflorida.com. 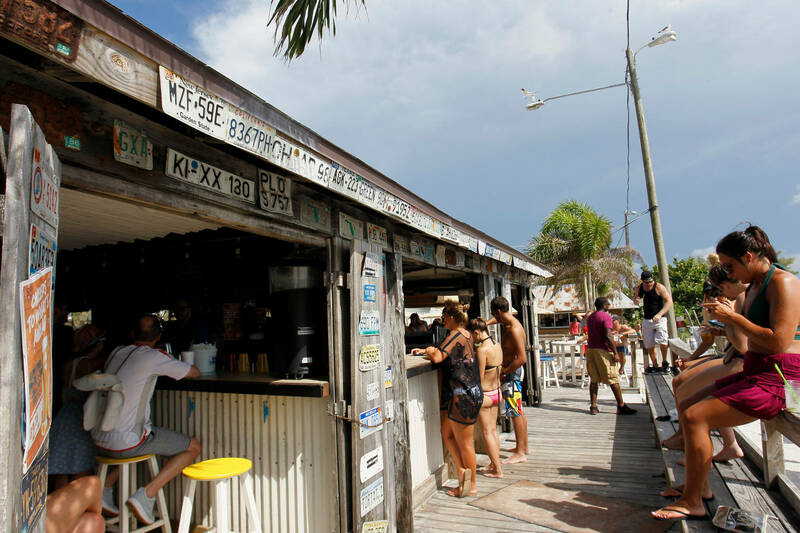 The Toasted Monkey Beach Bar is another St. Pete Beach staple. 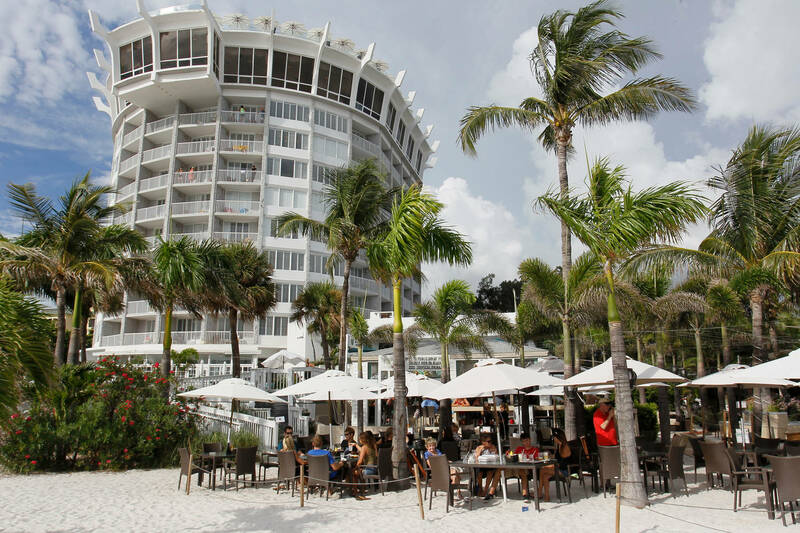 Its vibe is simple, yet well executed — affordable staple cocktails, inviting bartenders, well-placed right between the sand and the pool, and daily live entertainment. If you ask any local for beach bar suggestions, the Toasted Monkey will be at the top of the list. It takes about 6 minutes for your brain to react to alcohol. Drink this: A rum runner or a strawberry daiquiri. Or both. Nothing too fancy at the Toasted Monkey, just the essentials done right. Insider’s tip: The restaurant and bar at the front of the Howard Johnson — also called the Toasted Monkey — serves breakfast daily until 11 a.m. Bloody Marys and mimosas, anyone? Open: 7 a.m. to midnight Sunday through Thursday, 7 a.m. to 1:30 a.m. Friday and Saturday. Info: 6110 Gulf Blvd., St. Pete Beach. thetoastedmonkey.com. Rooftop beach bars are so hot right now, and Hotel Zamora has one of the original lounges. The bar on top of this off-the-beach hotel takes up the whole roof. The faux hedges and turf make it feel like a garden. During peak hours, there are two bars open, and plenty of space to mingle or relax in one of the dozens of chaise lounges or outdoor couches. 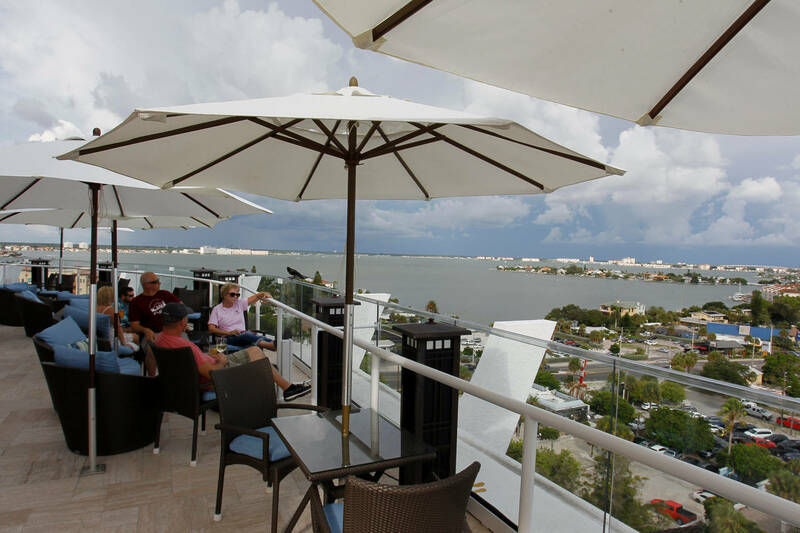 The 360 Rooftop Lounge doesn’t embody the typical beach bar atmosphere, but it sports stunning views of St. Pete Beach. It’s the perfect spot for a sunset or to watch a storm roll in. Go here if you’re looking for a city vibe but still want to be steps away from the sand. The average bottle of wine contains 600‑800 individual grapes. Drink this: 360 Rooftop and the downstairs bar offer some of the most creative cocktails you’ll see on the beach. The Castilian gin and tonic mixes No. 3 gin and premium Fever Tree tonic with strawberry, rosemary and a grapefruit rind. Then there’s the You’re Making Me Loco with Maker’s Mark, ginger lemon syrup, basil and basil sugar crystals. 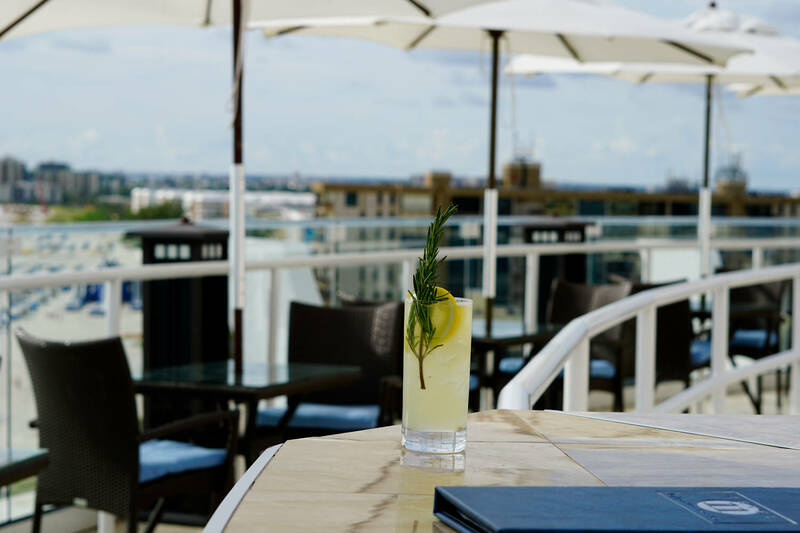 Insider’s tip: Take advantage of the free valet parking at the Hotel Zamora if you’re headed up to 360 Rooftop. There’s also a sunset happy hour from 4-7 p.m. with $5 and under beers, sangria, well drinks and wines. Open: 3:30 to 10 p.m. Monday to Thursday, Friday 3:30 p.m. to midnight, Saturday noon to midnight and Sunday noon to 9 p.m.
Info: 3701 Gulf Blvd., No. 101, St. Pete Beach. (727) 456-8660. thehotelzamora.com. 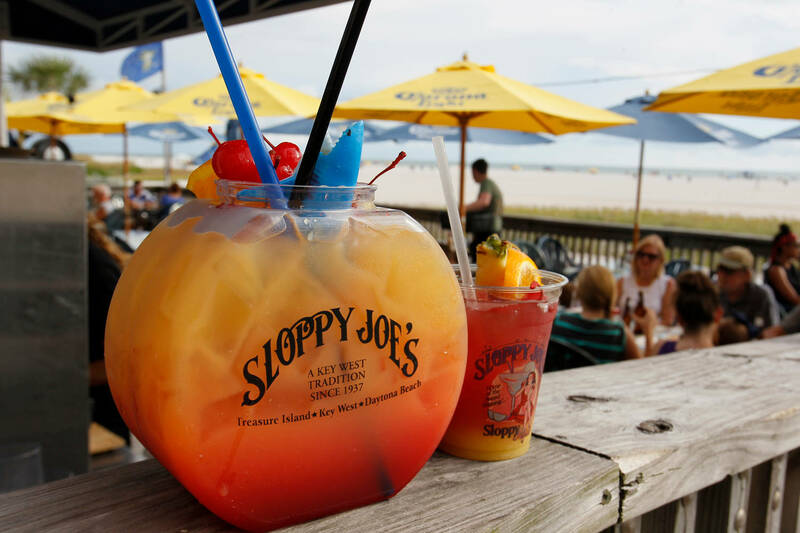 Dine and imbibe at Sloppy Joe’s in Treasure Island. The Key West hot spot also has a home on Treasure Island, bringing its signature Big Sloppy sandwiches and fish bowl cocktails to the Tampa Bay area. 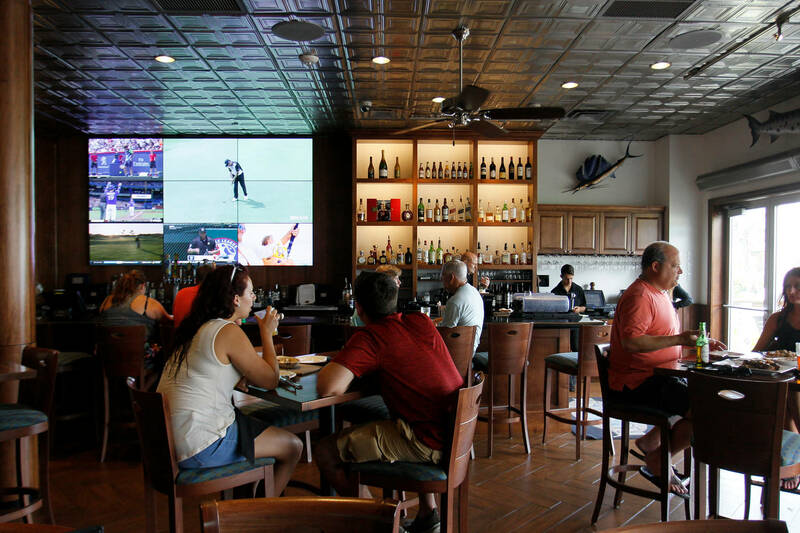 Like the bar in Key West, the one at the Bilmar Beach Resort also pays tribute to Ernest Hemingway in its decor. When the original Sloppy Joe’s first opened in 1933, Hemingway and his cohorts were some of its most rowdy regulars. 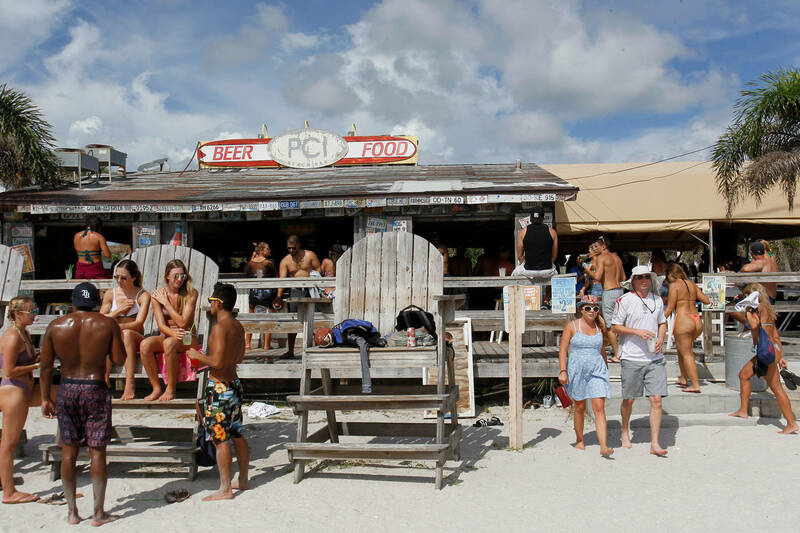 The Sloppy Joe’s on Treasure Island maintains that Old Florida feel while also providing beach bar staples. Drink this: Any of the bar’s concoctions in the 64 oz. fish bowl, like the classic Sloppy Rita or the Key West Fish Bowl. You get to keep the plastic fish bowl so you can illustrate to your friends about how much your drank on vacation. Insider’s tip: Sloppy Joe’s is another beach hang that actually provides parking for its restaurant and bar. Locals like to beach bar hop, too. Info: 10650 Gulf Blvd., Treasure Island. (727) 367-1600. sloppyjoesonthebeach.com. One of the newest in the Jimmy’s line of Clearwater Beach hot spots is Jimmy’s on the Edge at the Edge Hotel, part of a trendy hotel chain. 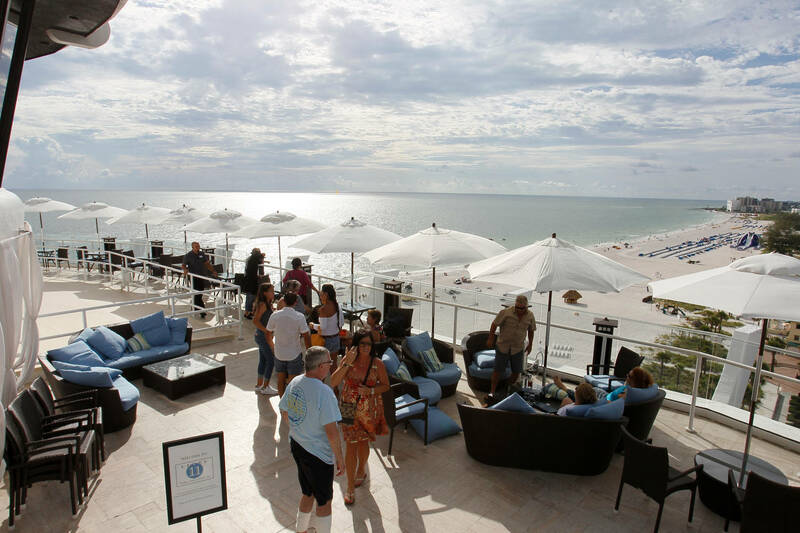 This rooftop bar overlooks Clearwater’s sugar sand, giving panoramic views of the country’s No. 1 beach. Jimmy’s on the Edge ups the ante with luxurious lounge furniture, a 20-foot-long fire pit and a 24-foot projection screen. 64-ounce beer growlers became legal in Florida in 2015. Drink this: The 505 Shot, served at 5:05 p.m. during the bar’s weekday happy hour of 3-6 p.m. Happy hour also boasts $1.50 beers, $3.50 rail mixers and $6 margaritas and pina coladas that will surely wash away the work week blues. Insider’s tip: Make it a Jimmy’s night by dining at Jimmy’s Fish House next door before ascending to the Edge. It’s an easy way to indulge in the dozens of specialty cocktails at Jimmy’s three Clearwater Beach locations. Open 11 a.m. to midnight Sunday through Thursday, 11 a.m. to 2 a.m. Friday and Saturday. Info: 505 S Gulfview Blvd., Clearwater Beach. (727) 281-3100. edgehotelclearwaterbeach.com. 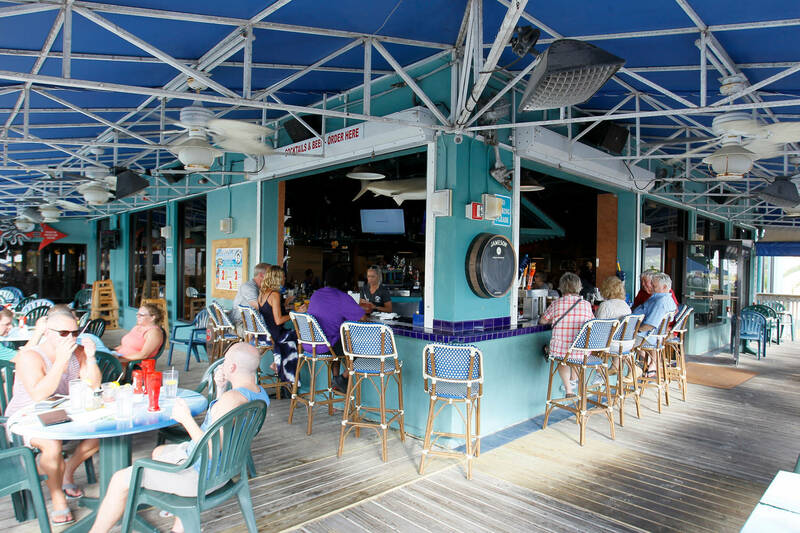 The Jimmy’s chain is king on Clearwater Beach, with one of the most popular bars being the rooftop Jimmy’s Crow’s Nest. The 10th floor bar and lounge offers stunning views of Clearwater Beach, even if it is technically across the street. Pier House 60 brags that its Crow’s Nest is the best place to watch the sunset on Clearwater Beach. It even has a sunset countdown clock outside its lobby and a live stream on its website. A standard-sized bottle of champagne contains about 49 million bubbles. Drink this: Rooftop Rum Runner, the local favorite with two types of Cruzan rum, blackberry brandy, creme de banana, pineapple and orange juices and grenadine. Insider’s tip: Park at the public parking garage two blocks down Coronado Drive. It’s probably the shortest walk to a bar you can find on Clearwater Beach. Info: 101 Coronado Drive, Clearwater Beach. (727) 683-0002. jimmyscrowsnext.com. Contact Chelsea Tatham at [email protected]. Follow @chelseatatham.